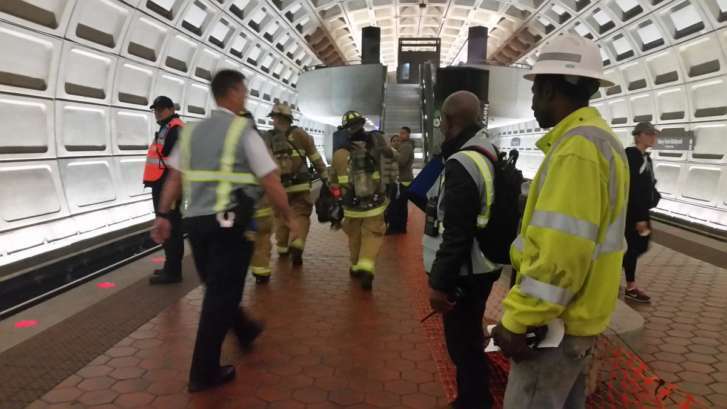 Metro launches full-scale training exercise to improve communications and safety. WASHINGTON — The Sunday morning quiet was broken up by sirens outside of the Navy Yard Metro station — but this was only a training exercise. Metro continues to hold full-scale training exercises around the D.C. region to improve on safety. This was Metro’s seventh full-scale emergency response drill, but it was the first one in 2017. The rail system has been doing required quarterly drills since the since the deadly L’Enfant Plaza incident that happened on Jan. 12, 2015. During that deadly incident, first responders experienced communication problems. Since that time, Metro and first responders have been working to improve communication with riders during an emergency. And communication was once again a major focus during this latest training exercise. In this scenario, first responders had to evacuate a disabled Metro train in the tunnel between Navy Yard and Anacostia Metro stations. Pavlik said this was also a fire and smoke incident. “We’re always looking to enhance communications with our riders, with our first responders. So we’re looking at unified command, how do we message to our employees, how do we message to our rides, so communications is something we’re always focused on,” he said. He said one thing that will help with communication is Metro bringing Wi-Fi to more and more stations. Pavlik said the next drill will be in Montgomery County, Maryland, but the date has not been set.